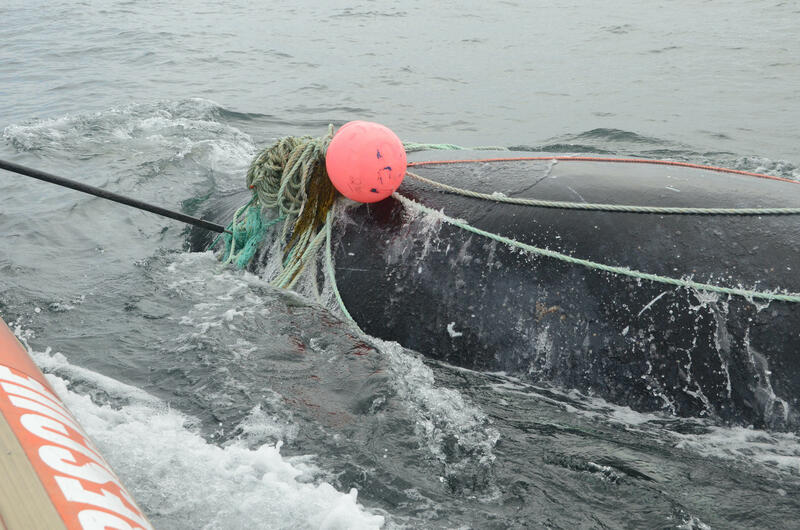 A juvenile male right whale tangled in fishing gear was rescued in August off Campobello Island. Photo courtesy Campobello Whale Rescue. A consortium of Atlantic states fisheries managers is calling for broad changes to the gear lobstermen use, in an effort to reduce risks posed to the endangered North Atlantic right whale and to ward off potential federal action that could be even more challenging for the industry. There are roughly 410 right whales left in the world, and they are at risk of potentially fatal entanglements with vertical rope lines lobstermen and other marine harvesters use to position and haul their traps. At a meeting of the Atlantic States Marine Fisheries Council in Virginia, its lobster board voted unanimously to set in motion the process that could lead to major changes in the East Coast’s lobster industry. “I don’t want NOAA making decisions on what this lobster fishery is going to look like in the future,” says Patrick Keliher, commissioner of the Department of Marine Resources for Maine, home to the country’s dominant lobster fishery, which landed some 110 million pounds of lobster in 2017 worth more than $450 million at the dock. Keliher says that the National Oceanic And Atmospheric Administration is developing a “biological opinion” that could include a formal “jeopardy” finding for the right whales, which under the federal Endangered Species Act could lead to severe restrictions on the state’s harvest. Visit Maine Public Radio for the full story.